Many players begin playing withborrowed clubs and second-hand balls out of economicnecessity. The same tight budget constraint can extendto the footwear, and even several years after takingup the game many are still wearing the everyday trainingshoes that have served them well from the first day onthe tee. Spiked shoes designed to offer greater gripIt is not uncommon for many players to wear thetraining shoes they use for other activities because,one, as mentioned above, it saves much needed cash toinvest on other aspects of golfing kit, and, two, itis simply not essential when starting out to sportfootwear specifically designed for playing golf. Thespike shoes designed to offer greater grip may improvean already tutored swing, but for rookies they are notessential. Those who head off to the local golf shop to buy their first pair of golf shoes will find themselves confronted with a whole wall of alternative makes andstyles. In short, the same dazzling array of swooshes,stripes and other trademarks of the majormanufacturers to be found in any of the high-streettraining shoe outlets. 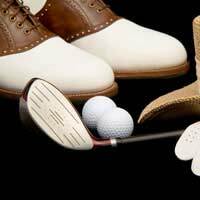 In common with all aspects of golf equipment, the shoe has beensubjected not only to the influences of sportingfashion but also the technical departments of themanufacturers, with each claiming particularperformance characteristics that cannot fail toimprove scorecards. Even for those with the time, money and theinclination to spend hours trying on various shoes andpondering whether a particular style or colour willblend in with the rest of their ensemble, a few basicsneed to be understood in the footwear department.Principal among these is correct fit and absolutecomfort. Playing a round of golf, on average, constitutes a distanceof about five miles. There is nothing more painful, orindeed more undignified, than walking up the fairwayon the 18th hole, perhaps in full view of the members'bar, sporting a grimace of pain and a matching anddistinctive hobble, all of which is the result ofblisters caused by ill-fitting shoes. The second important point to look for when purchasingis the type of spike on the sole of the shoe.Traditionally, metal spikes were fitted bymanufacturers, which would offer good grip on bothtee, fairway and green, and which could be removedfor cleaning away the turf that can cling to them,particularly on a rainy day. The downside of thesemetal spikes, in a similar manner to football boots,is that they can leave indentations or dig out smallpieces of turf, to the detriment of surfaces such asthe green. As a result a number of clubs have bannedtheir use, preferring their members and guests to usethe more modern rubber variety. These still offer thegrip but without any resulting damage to the course.They're also easier to clean, which is always a bonus. So when you finally decide to buy a pair of shoes,don't have your head turned by the vagaries of golfingfashion or the cardboard cutout of the famous faceendorsing a particular brand. Stick to the basics: agood fit and a good grip and you will putting yourbest foot forward.